The deadline for paper submission is March 18, 2016 at 11:59pm PDT. Authors will be notified of their papers' disposition on or before April 22, 2016. Final versions of the accepted papers will be due on May 6, 2016. The workshop will be held on June 1, 2016. 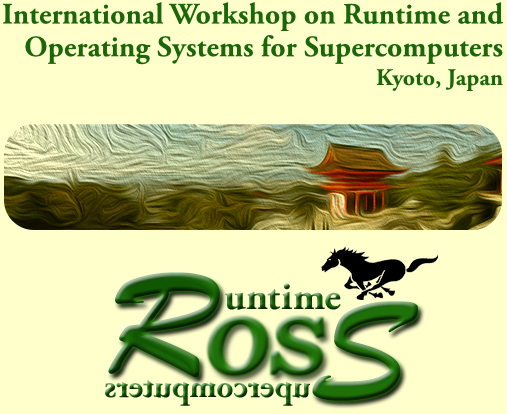 The ROSS workshop proceedings will be published electronically via the ACM Digital Library. Submitted manuscripts should be formatted using the ACM SIG Proceedings alternate format; please make sure you use the latest version available. Extensive documentation can be found at the ACM site. The maximum length is 8 pages. All papers must be in English. We use single-blind reviewing process, so please keep the authors names, publications, etc., in the text. The workshop uses the Easychair conference manager for submission and notification. Start the paper by providing the title and the abstract in plain text, and then submit the full paper in PDF. The submission system supports unrestricted reuploading of updated versions until the deadline, so there’s no need to wait until the last minute. Please click here to start the process and follow the instructions. If you experience any problem, please contact us immediately. Registration will be handled by the HPDC 2016 conference. See this page for details.